The garage is getting a little warmer so it is time to make more shuttles. They will be mainly pop-a-bobbin ones but we had a special order for some ebony post shuttles, one of which I have photographed on a white hyacinth. Actually they are going to a customer in England who could not find any wooden ones in our part of the world. Not a brilliant photograph, this morning is dull and it is drizzling with rain. This shuttle has a dimple on the top and bottom so that you can comfortably hold with your thumb and finger without them slipping off. The next two have also been promised and will be setting off on their long journey any day now. This time pop-a-bobbin ones, a Cocobola Rosewood and an Olive shuttle. I really do need to get back to tatting but there doesn't seem to be any spare time at the moment. I am still knitting, but doing other things as well. When I first received Martha's book 'Button Jar Tatting' I made two of these bows, but can only find one! 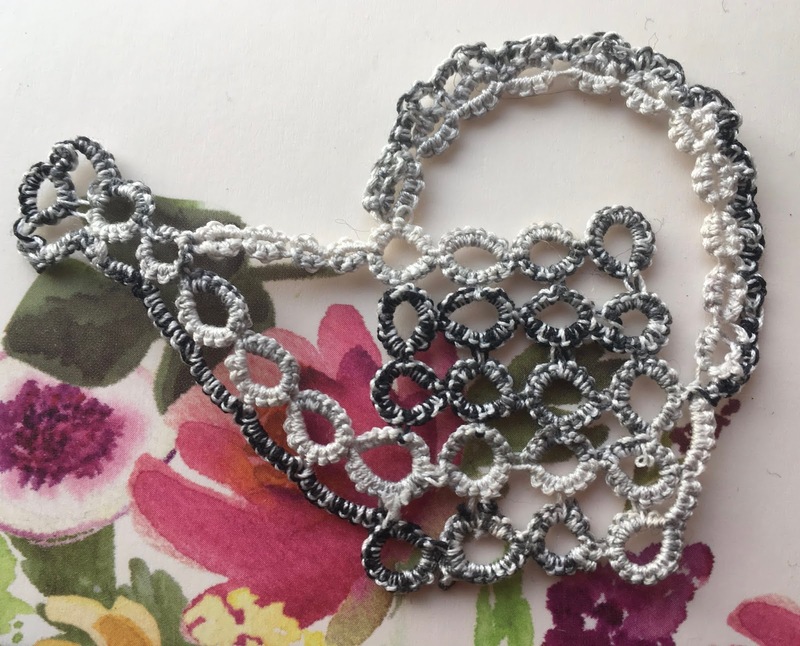 Sometime in the future I intend to make it into a choker, there are two large picots at the top on each side to work a chain, you can just about see them. Then I decided, rather foolishly, to try my hand at macrame. The reason being that I want to teach people to do it at the next adult craft club. So ended up buying a job lot of string off e.bay and wondering if I have done a wise thing, now in a right knot about it all, the idea is not going to plan! Also 'im in the garage has been making more shuttles, only this time to order as people have found out about them. Sometimes you need a break from things, call it a holiday (vacation), respite, whatever. Don't get me wrong I enjoy tatting but I was finding the time I spent doing it very limiting. I needed to do other crafts, so decided on a bit of knitting, haven't knitted for years. 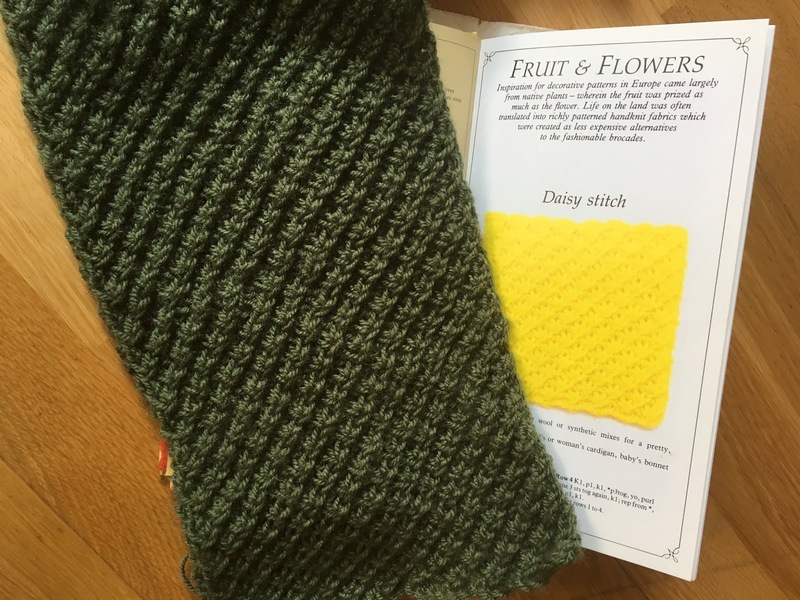 The aim is to knit a throw. I am in no hurry either, was going to crochet one but the wool I have is a little diverse and did not think it would look good if used for crocheting. Below are the two plain colours to start the project. The picture does not show the true colour it is a dull lilac and the pattern is Harebell. Again this green is dark but probably not as dark as the picture and is knitted in Daisy Stitch. 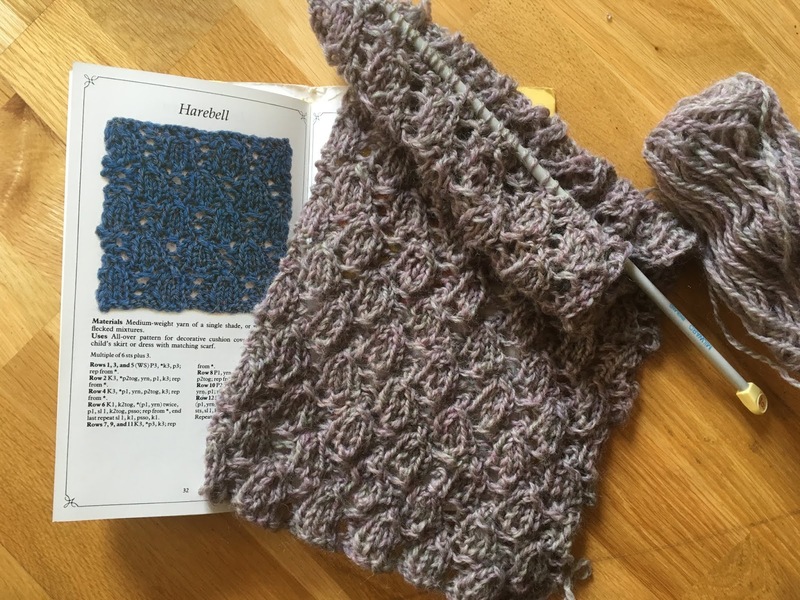 The aim is to knit lots of strips like this in different patterns and then join them together. I will have to crochet around the edge, but expecting this project to last at least a year! 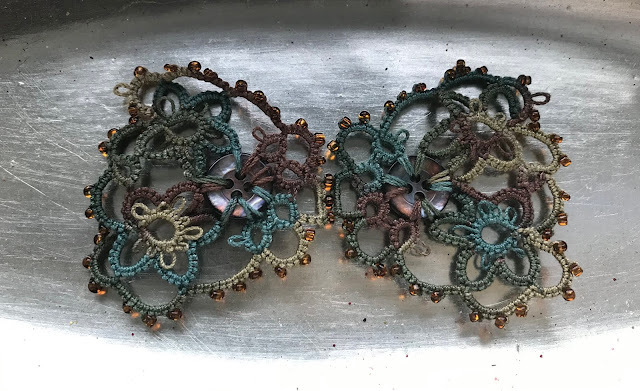 Need to return to tatting at some point! As I said just taking a break! After awhile I always come back to Martha Ess's Canopy Bookmark especially if I am winding two threads together as I love the way the long picots show up the different strands. This was so difficult to photograph as I was trying to get some natural light to show up the colours. I think it is time to get back to some one strand thread tatting as this method was beginning to get a bit of a challenge when I got into a tangle after starting another project! Not only have I been clearing out and tidying stuff at home I have also been tackling a huge store room in the church which also contains a lot of craft stuff. Some of it has been left over from previous children's activities, which have now come to an end. In the find were these threads, I wound them together with cotton threads in my stash and made snowflakes. The snowflakes are from Lene Bjorn's book. The top one is The sixth Day of December and the bottom one is The tenth Day of December. I am now experimenting with more colours and different thicknesses of cotton thread. Sadly you can't see the sparkle on them very well.